School is turned upside-down this week with End-of-Course testing. My schedule changes day-to-day, but still I am managing to keep my art production moving. I found a break in my schedule for sketching, just received one of my large watercolor still lifes from the framer, and am making serious decisions regarding presentation for my first art festival of the year coming up inside of three weeks. Twenty-six of my one-man-show collection have returned to my home, and they now hang throughout the house, improving my domain. I am excited about hanging some of these in my art booth April 15. Finally, my art booth, after all these years, will be upgraded to the standards I have always wished, but lacked the means. I can’t wait to post photos of its new look once it opens again. I laughed out loud this morning when I read some of the wit of Barnett Newman. In response, I spent a good part of this day painting so I could have something to look at, and writing in my journal so I would have something to read. On a more serious note, it feels great to be painting again, the workshop last week really got my juices flowing, and the bad weather threatening Corpus Christi gave me the space to return home and pick up the brush again. I am currently trying to figure out how to close out these two Missouri scenes, the one above from Winfield, where I photographed a store front back in 2010 or 2009. The one below came from a section of Highway 30 west of High Ridge that I photographed in the rain last Thanksgiving as I was beginning my return to Texas. Newman chose his terms ever so deliberately: “plasma” (or “plastic”) connotes an organic fluidity; it also suggests the more familiar word “plastic,” which refers to an organic quality in materials. Semantically, “plasmic” and “plastic” are closely related (they derive from the Greek word for molding or forming); but they are also inversions of one another, with the one term oriented to living organisms and the other to inert matter. Simply put, the plasmic is lively and active (like the movement of thought, it gives form to things), whereas the plastic is passive (it is the form that thought and other forces produce). The various drafts of “The Plasmic Image” explore the links between “plasmic” and “plastic,” between creative thought and the material form it can assume. Newman’s guiding metaphor is this: plasma, as the fluid part of the body communicates thought. Thus the plasmic and the plastic bond together whenever “the new painter is concerned with his subject matter, with his thought”. Countless times while posting on my blog, I feel that I am wearing my underwear on the outside. This is one of those moments. I love reading artist’s writings about the task of making art. Robert Motherwell has been a favorite of mine for years, and now, one of his contemporaries, Barnett Newman has crossed my desk. A former student of mine, Ian Watson, now a serious painter pursuing a path that has issued from his serious study of Abstract Expressionism, has passed on to me this book on Newman’s writings. Though my painting style is nowhere near the Abstract Expressionists, the more serious thinkers among them engage my mind in the most satisfying way. I don’t feel that I have a clear-cut aesthetic theory of art, or even a style for that matter. I love the process of making art, and love reading the thoughtful writings of artists who engage in that same enterprise, always hoping one day I will figure out what I am trying to do and express it well. Finishing my term as Artist-in-Residence day before yesterday has yielded an experience similar to jumping into a warm pond after emerging from a sauna. Yesterday, back home for the first time, I spent the day in galleries and museums, searching for some kind of direction of where to go next in my work. I enjoyed the museum time, but nothing really clicked with my own work. I had trouble going to bed last night, finally succumbing at 2:00 a.m. Waking at 8:00, groggy, I made coffee, built a fire (wow, a delightful 43 degrees outside! ), settled into my reading chair before the fireplace, and read extensively from Thoreau’s journals and Barnett Newman’s writings. Coming across the introductory quote posted above, I thought about that conflict between the artist’s mind and the materials s/he is trying to manipulate, and I looked up at this watercolor I started last year and abandoned. The painting is of a section of bluff carved out by Highway 30 west of High Ridge, Missouri. I drove through that section last Thanksgiving on a dreary rainy morning, en route to my Texas home. I was so taken by the soaked landscape under the dark morning skies that I turned my vehicle around, drove back, got out in the rain and took several photos.Once I got home I began the painting enthusiastically, but nothing seemed to go right. I tossed it aside and forgot about it. Once I found it again this year, and wished to give it another try, I could not find my reference photos among my computer files. I wasted almost an entire Saturday morning looking for them. Disgusted, I put the watercolor next to the fireplace and went on with my life. 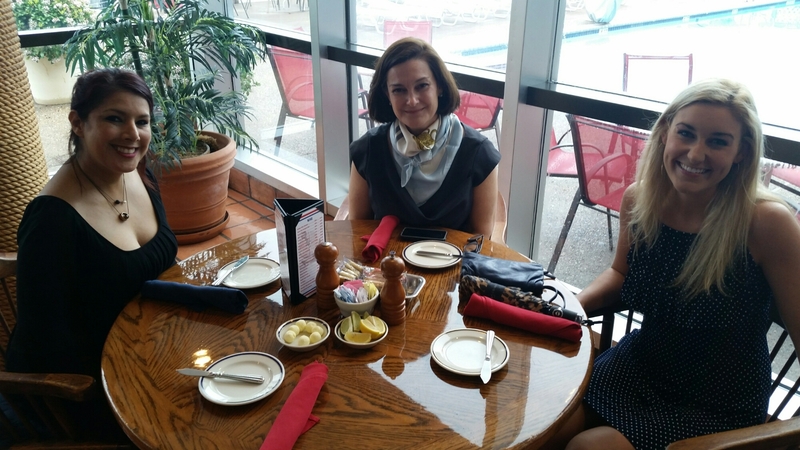 Then, I came across the photos just before leaving on Spring Break for Corpus Christi. I thought about this painting the entire time I was on the coast. 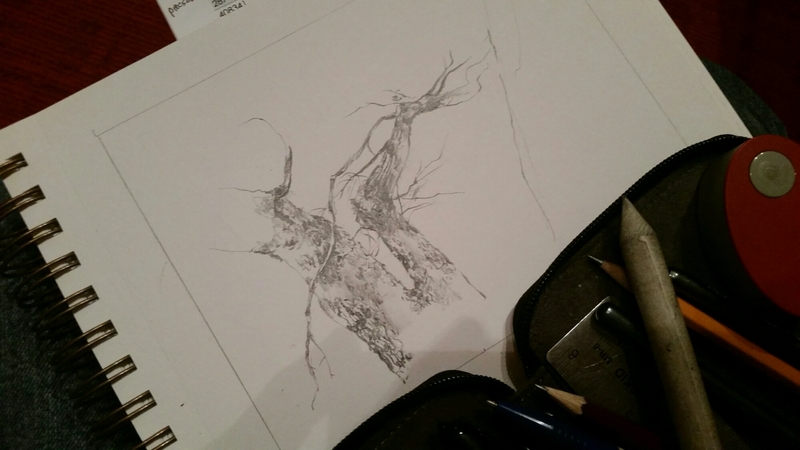 Reading the comments on Newman’s theory jolted me and I returned to the drafting table. I love the slice of landscape I viewed that morning, and have re-visited countless times in my mind’s eye. And this morning, I decided to push my mind and imagination harder against the resistant colors and shapes to see if I could wrest some kind of pleasing composition from it. 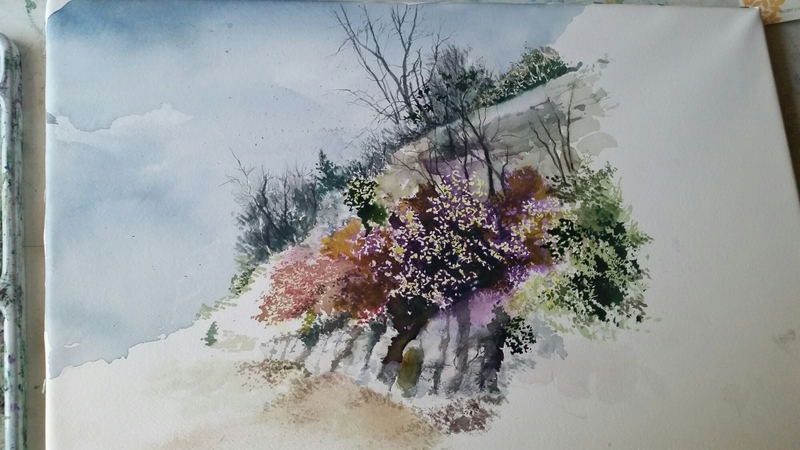 I keep working back and forth between the complementary violets and yellows as well as the greens and reds. And, as many times before, I am lost in the network of winter tree limbs that trace out a labyrinthe against the sky. I purchased an atomizer from Asel Art yesterday (I lost mine from 1974!) and sprayed some Hydrus liquid watercolor across certain areas. I feel like a small child in the classroom, but that is O.K. I’m back to the joy of discovering new artistic possibilities and am enjoying this ride in particular. 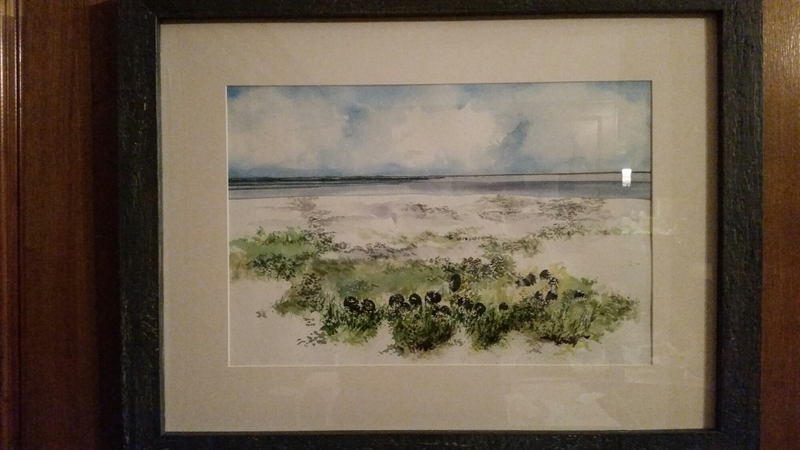 Words fail to convey my deep appreciation to all the people who enriched my life over the past year with the Artist-in-Residence experience at the Texas Laguna Madre. I posted my favorite photos of the ones who worked closest with me in getting this exhibit off the ground. Though I’m now more than six hours away, I feel their spirits and treasure every thought of them. The show will come down March 26. 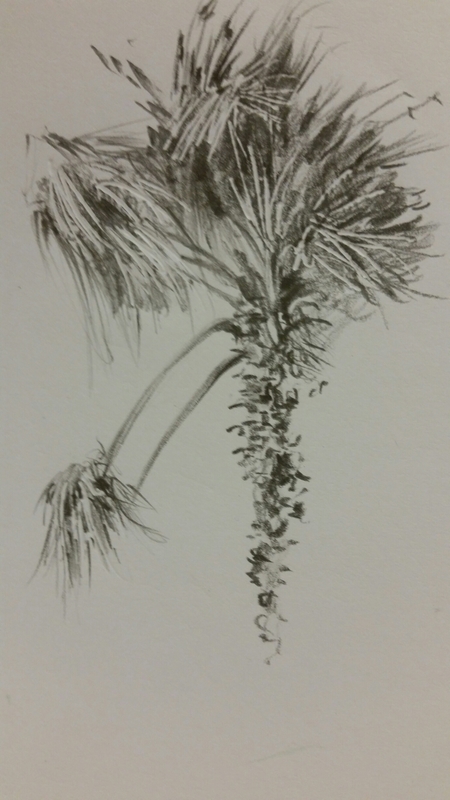 After viewing that exhibit, I enjoyed an evening in the Kimbell Art Museum and Fort Worth Museum of Modern Art, viewing the works and making quick sketches in my journal. The enthusiasm and drive of this group of workshop participants was beyond belief. I walked among them in a state of perpetual amazement during the two-and-a-half days we spent together. When I return to my work schedule next week, I’ll carry every good memory from the coast with me in gratitude. I’d rather be ashes than dust. I’d rather be a superb meteor, every atom of me in magnificent glow, than a sleepy and permanent planet. The proper function of man is to live, not exist. I just wanted to say Thank You to all the well-wishers for last night’s Artist’s Reception at the Art Center of Corpus Christi. The gallery was full all night, conversations were very rich, people I’ve come to love in this Corpus Christi and surrounding community were there with genuine support and some pieces sold. I could not be happier. When I was younger, I really dug that Jack London quote posted above, along with Kerouac’s notion of Roman candles exploding in the night. At this age, I no longer feel I’m packing that kind of dynamite. Last night’s experience was deeply rewarding, but I seem to function better these days when things are quieter. Today I slept in, tired from the late night antics, but now, with batteries recharged, I’m anxious to meet my workshop participants once more. Time with these artists has been sublime, and I’ll be sad to say good-bye when we finish today. To create oneself through making (either by writing or painting) is an ethical act of decision and passion: you become formed, differentiated from others; you feel your place in the world and find your wholeness, integrity. The pre-dawn mornings in Portland, Texas have been soothing this week. Temperatures are always lingering around 70 degrees, as a foggy mist hovers over the dawn. I love driving through the darkness toward the local Starbucks, and then watching the grey light emerge. The atmosphere is rich for reading and writing, and I am enjoying immensely this book of Barnett Newman writings on art that an artist friend has lent me. I always manage to settle into this coffee shop before 7:00 and the workshop doesn’t begin until 9:30. My ideas this morning are driven by the comment posted above from the Introduction to this book. Yesterday’s experience of watching watercolors emerge from the brushes and minds of various individuals renewed for me that joyous “shock of recognition” (Motherwell’s words) as I saw how these artists view the world through their own eyes and filter their interpretations through their own souls. One of many highlights for me was meeting a retired Episcopal priest who expressed much of my own sentiments as we discussed our seminary training and how our lives have unfolded since that training many decades ago. Both of us are grateful for our education, and for the subsequent freedom to explore new vistas, applying our old disciplines to new discoveries. 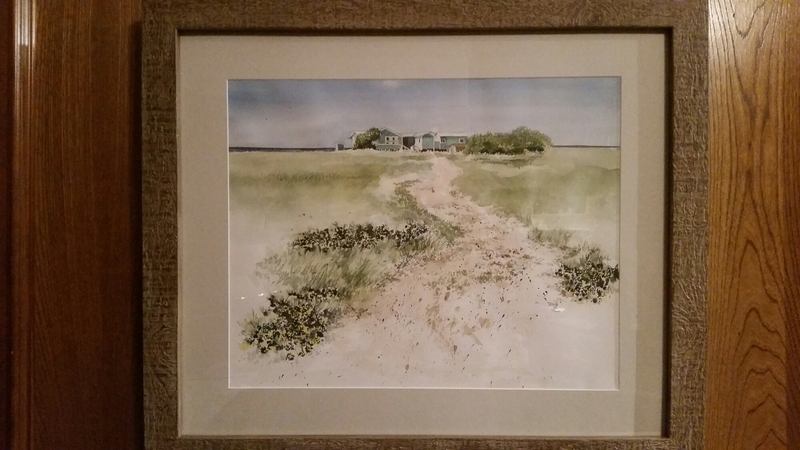 I could feel his passion for making art, and was astounded as I watched his harbor watercolor come into focus. I could only admire the effects of his solid training and at the same time appreciate his willingness to explore new methods rather than cranking out the same thing he was used to doing from the past. I also delighted in the work of a retired architect, one who referred to himself as “old school” because he drew his creations with his own hands and tools instead of relying on computer-generated schemes. His adept skill in using a straightedge and watercolor brush showed a disciplined eye, and at the same time he knew how to use the brush in a painterly fashion, instead of being bound by precision alone. I have always enjoyed that Apollo-Dionysus tension, with Apollo representing the rules and structure, and Dionysus representing the flourish and spontaneity. I am anticipating today’s session with eagerness because these painters, most of them belonging to the same watercolor society, are not carbon copies of one another. And during the closing critique session yesterday, I was touched by their genuine regard and respect for one another. When the artist community is a nurturing one, everybody grows and experiences the very best of the art-making enterprise. So, here’s to new and affirming experiences . . . 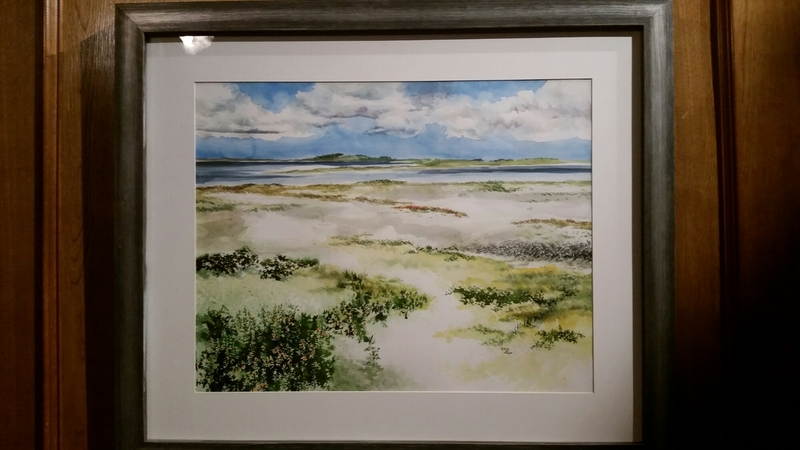 The Watercolor Society of South Texas has shown an abundance of professional-level skill with their 46th annual exhibit now featured at the Art Center of Corpus Christi. And today they demonstrated that they know how to run a workshop. 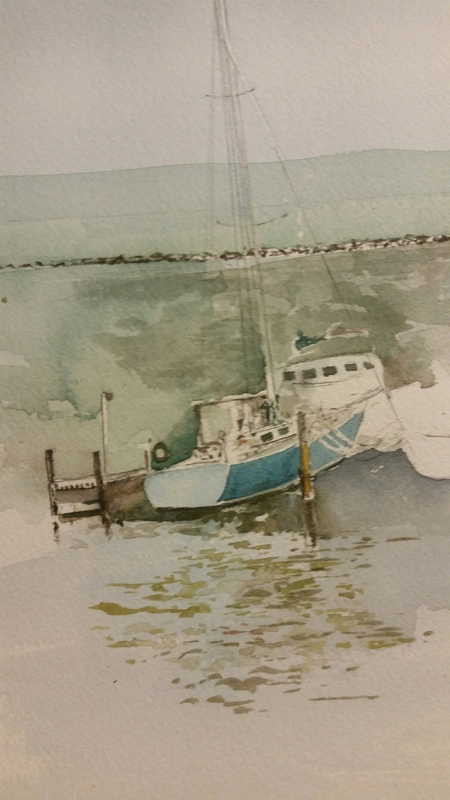 I love leading workshops in watercolor, and I have had a few. But there is no describing the speed and skill I saw on this first day of painting, with overflowing enthusiasm among these members. This group of artists had me wanting to go out and paint until dark when our session ended at 4:00 this afternoon. I cannot wait to meet them again in the morning. Tomorrow is going to be a longer day: we have our session from 9:30-4:00, and then the Art Center extends its hours into the evening, with the Watercolor Society of South Texas holding a reception for their exhibit that just opened, and I in the neighboring gallery having my own artist’s reception for the “Week on the Laguna Madre” exhibit. We will be there till 7:00. Outside the Center, the Farmer’s Market will hold its weekly event, and food trucks will line the street. We’re hoping for a large, enthusiastic crowd. 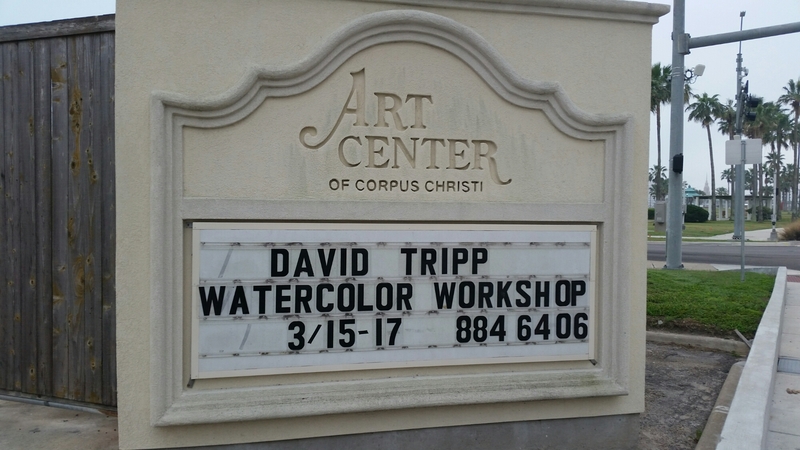 This will be the third time I lead a watercolor workshop in the Corpus Christi area. And I just realized that my mental/emotional preparation has always been the same–to rise while it’s still dark, repair myself to the neighborhood Starbucks, sip my coffee, nibble at my sandwich, and scratch out on small pieces of paper the ideas beginning to percolate, hoping that they will resonate in a few hours when I face a room full of strangers who have trusted me enough–a stranger–to help them become better watercolorists. I’m reading the Bible this morning. The opening verse in Genesis records that “in the beginning God created the heavens and the earth.” St. Augustine, poring over those words, concluded that the first thing God created was time. God, an ocean of eternity, pure Being, created time, and then simultaneously created space. Then God began organizing the space–dividing light from darkness, land from water–manipulating the space before him. Abstract Expressionist artist Robert Motherwell said that drawing was a way of dividing and organizing space; the artist manipulates space. Twenty-seven verses into Genesis, the words testify that God finally created humans “in his own image.” The Imago Dei, image of God. What does it mean to be created in the image of God? When the first thing the Bible records about God is that he is a Being who creates, then creates humans in his own image, I like to conclude that humans were created with the essential capacity and will to create. We create because it is in us. Humans create, whether they be artists, laborers or executives–humans manipulate the space before them. Does a bird singing in the morning realize the beauty of its song, or is the bird just doing what birds do? Is a spider aware of the beauty and symmetry of the web it spins, or is the spider just doing what spiders do? Why do artists create? Because it is in them; people are constituted to create. I hope my workshop participants will appreciate that they will improve as artists by making art and more art. When one continues to create, s/he cannot help but to improve. Bach wrote a cantata a week in the service of the Church, and some of the pieces weren’t that good. But had he not had the courage to compose inferior music, he never would have gotten to the good work. Emerson said that the pump brings up the muddy water first, before the clear water follows. Likewise, writers and artists have to get the junk out on the paper before the good stuff follows. There is plenty of debris-clearing that precedes good art. T. S. Eliot created a great deal of good poetry, but also a great deal of bad poetry. But he created. He is T. S. Eliot. Artists create a large body of good work and bad work. Artists create, period. My hope (prayer) for this workshop is that I hand the artists several more tools for their toolbox. Every workshop makes me a better artist, because I learn a great deal from the participants’ suggestions and techniques, and I hope they are learning more from the suggestions and techniques I offer in return–a gift exchange. The day has been busy beyond words. 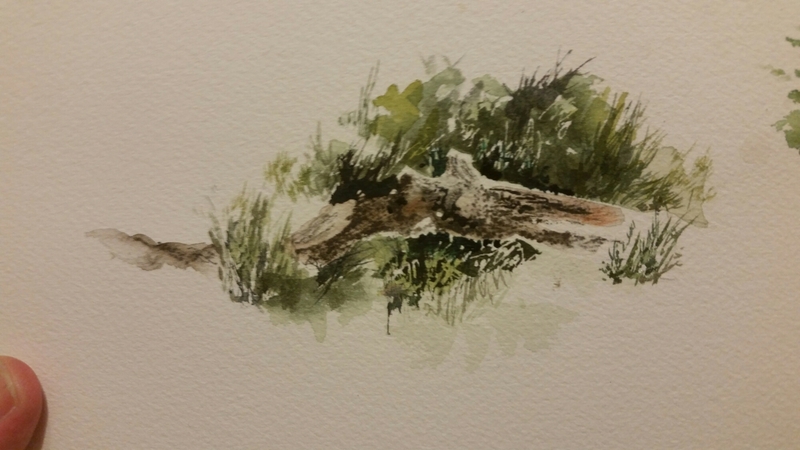 Poking around Portland and Corpus Christi, I found several subjects to sketch in watercolor and pencil. 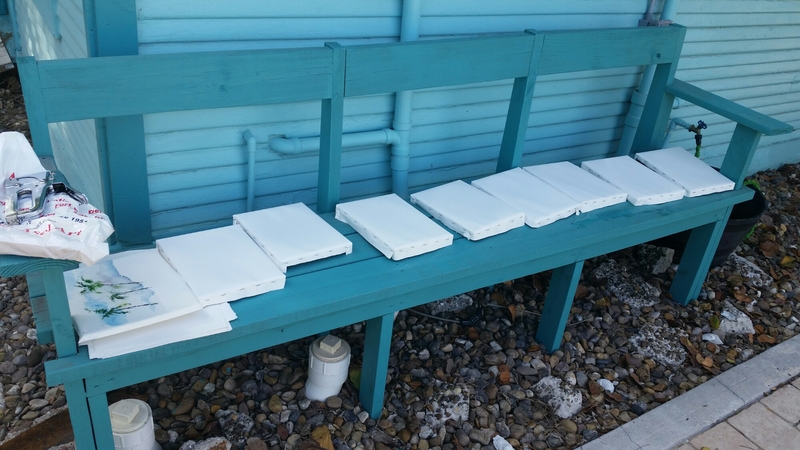 I also stopped long enough to stretch paper on 9 x 12″ stretchers, enough for 8 paintings. I felt the way I did the first day on the island last summer. I was also surprised to see my name on the marquis as I drove by the Art Center of Corpus Christi this morning. I’m exhausted tonight and the first workshop begins in the morning. I suppose if I’m not ready by now, then I’ll never be ready. Thanks for reading, and wish us all luck.